You know that feeling you get when something is right on the tip of your tongue? Playing with Sporcle is like having that feeling in your brain all the time, which sounds awful, but it’s surprisingly awesome. 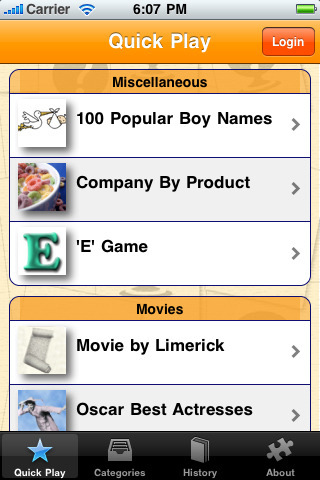 You may have visited the original Sporcle website once upon a time, since they’ve been around for a couple of years, and their new app is basically the same thing, only in a portable, iPhone friendly format. Sporcle is designed aorund user-created trivia games where you have a set time limit to list all the items of a given subject, for example, the names of all the dwarfs in Snow White. It’s a marvelously simple concept, but it’s also a lot of fun. The quizzes are all divided up into categories, which range from light-hearted entertainment to heavy duty history and science, so you can almost always find one to suit your particular mood or expertise. Sporcle also keeps track of your progress, so if you wanted to use Sporcle to help you, say, memorize the chemical elements or start training for pub trivia nights, you’d be able to review your quiz history and see how you’ve improved. You also have the option of playing on or offline. However, Sporcle’s biggest issue is the number of quizzes available. Currently, the free version gives you access to 25 quizzes, while the premium version has around 250. This sounds like a lot, but even with the premium version, it feels like you run out of content quickly. This is in stark contrast to the free website which hosts thousands of games. However, developers claim that future updates will bring more content, so keep an eye out if you’d rather hold off on buying it now. Personally, I’m a big trivia buff, so I’ve been really enjoying this app, even with its relatively spare content. Sporcle has been and remains one of my favorite trivia sites to visit, and this app captures that same addictive, head-crushing, and altogether pleasurable experience. AppSafari review of Sporcle was written by Tracy Yonemoto on May 13th, 2010 and categorized under App Store, Free, Games. Page viewed 4302 times, 1 so far today. Need help on using these apps? Please read the Help Page.